I love TippyBlue in the bluebonnets! So cute, and thematic. How do you upload your photos? In the Quick Reply box, there should be an option to "Insert Image." It looks like a tiny picture of a tree, the third button from the RIGHT. Click that, and it will give you options to Insert Image. I prefer to upload my pictures to Picasa, but other people use other services like Photobucket which are fine or maybe better. If you upload to another site, you can right-click on the image, Copy Image Location, and paste it into the "From URL" option. I uncheck the box because I don't want MiceChat to host a copy. By default, it appears the photos come up as tiny thumbnails, so you can double-click and change settings. I made these "Center" and "Large." "Yay! I cannot WAIT to see your photos!" The Duffy Bus that tours throughout Japan received a new design in anticipation of Duffy's 10th Anniversary. And thanks for the Duffy Bus info, MikkiMausu. So funny that it dresses up, too! It looks great. It could've been a disaster, but it works. I wish they'd done the curtains in sailcloth, though, rather than fur. Oh wells. MikkiMausu99 - I love the Duffy tour bus! That's really unique! Thank you for informing us. 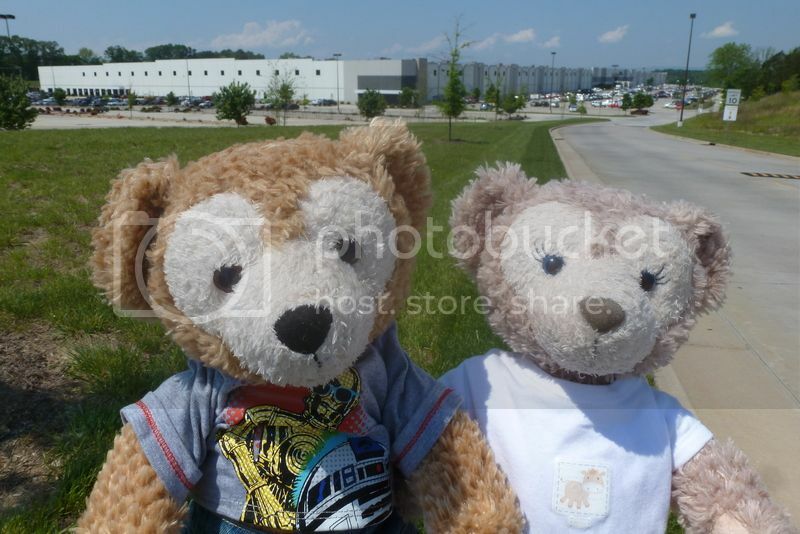 Today da bears and I went on an Amazon warehouse tour in Chattanooga, TN. The fulfillment center, which is what they call their warehouse, opened in 2011. It is 1.2 million square feet and there are 1,500 full-time employees who are eligible for benefits on the first day of employment. All their fulfillment centers got retrofitted in 2012 to be climate controlled. This fulfillment center only ships items that are giant plastic tub sized or lower (no kayaks or big screen TVs). 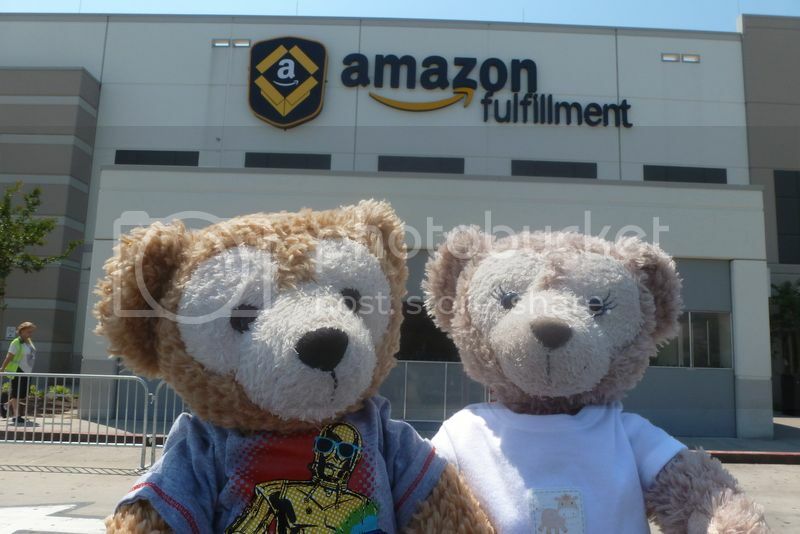 The fulfillment center tours are free but only take place 2 days a month, twice a day. I signed up for this way back last December, but I only told Duffy and Shellie May yesterday because I know they are like little kids with anticipation and would be bugging me, "when is the Amazon warehouse tour? Is it coming soon? How much longer NOW?" When we saw it, we all were amazed at how humongous it is! Inside we were only allowed to bring a wallet, phone, and keys, and no cameras or video recording were allowed (cell phones must be in our pocket at all times). We saw a video and then three guides took us on a tour, with us wearing headphones broadcasting the tour guide's narrative (it's loud in there)! There are vending machines spaced throughout the fulfillment center where an employee can swipe his/her badge and get free ear plugs, gloves to protect their hands from cardboard cuts, box cutters, or whatever they need to safely perform their job. Their main break room also has Microsoft Xbox consoles in case you like to play video games. Um, yeah, I had to tear Duffy away from that to see the rest of the tour. The tour lasted an hour and then we got an Amazon key chain flashlight as a souvenir. There are two Amazon fulfillment centers closer to me (one in Murfreesboro and one in Lebanon) but they do not give tours. Sometimes when I order something, even telling them "no rush shipping (to get $1 digital credit)," items show up before 6 a.m. on a Sunday. It's like ding dong, Avon lady...no, ding dong AMAZON! Luckily, if I'm not already awake I sleep through the doorbell as my bedroom is in the back of the house. As you may know, Lil D and Duffette are what you might consider Teddy Grahams aficionados. So when I spotted a new flavor at the store the other day, I knew we had to give them a try. So what new magical flavor has Honey Maid concocted this time? Last time we reviewed the Strawberry Banana flavor with mixed opinions, so we'll see what happens here. "Hmm, this one looks good." "Mmm, yummy! Wish I had some frosting to dip them in!" Duffette, being more ladylike, prefers to eat from a plate rather than off of a foot. "Hmm, they definitely do have a vaguely vanilla-ish, Funfetti-esque flavor to them. Tasty!" Naughty Lil D feeds one to his puppy, Reese (BTW, some of you may remember two years ago (eek!) when we first got the puppy and I was soliciting opinions on names. Ultimately we ended up sticking with the 'sweet' theme, as Lil D named him after his favorite candy.) He likes it! Then again, he's a dog so he likes everything. So all in all, I'd say these are a success! Both bears enjoy this flavor much more than the strawberry banana. Hopefully this flavor sticks around longer than the strawberry banana and apple. I love what TDS/OLC puts out, as everyone knows. But Lil D and Duffette continue to be proof positive that it is not impossible to be 100% authentic Duffy, even if you come from the Salvation Army...or was it a thrift shop? I think we might need a digest post, Diznygrl! I'm forgetting his legacy! Hehe DuffyD, I got Lil D at Goodwill, to be exact. It was a hot August day in 2011 and I was getting ready to leave the store, when a pair of Mickey bear feet caught my eye in an overhead wallet bin as I passed the clothing racks. He was lying up there rather haphazardly, not even with the rest of the stuffed animals where he belonged. I almost passed on buying him because his face was a bit dirty and part of the felt from his nose was torn (chewed??) off, but he had such a sweet face, and I decided that his beat up nose gave him character, so I took him home, gave him a bath, and the rest is history. I go to Goodwills a lot, and that was the first and only time I've ever seen a Disney Bear or a Duffy, even though you can usually find all sorts of neat Disney stuffies there. One would think that with all those Disney Bears they put out years ago, all of the ones in multiple colors, etc. that I would have found at least ONE other one in the past 4 years, but nope. So yeah, Lil D may not be a 'Duffy' in the official sense, but I think he's one special little dude. I'm glad everyone here in the Duffy community seems to think so too. Thank you! I :love: that story! Has anyone else noticed that pinterest has taken up all the Duffy and Shellie May google search results? I don't have enough room to mark this as a bookmark/favorite, so I just google "share your duffy photos". Where before it would just come up, now everything is pinterest, and I have to search micechat, then go to forums, then type in share your Duffy photos to get here. I sure hope this forum doesn't get discontinued! It's SOOOO fun! It looks like that phrase comes up on Pinterest because people have "pinned" photos from this very thread. So they end up displaying an image with a caption like "Share your Duffy Photos - Page 62". So paradoxically, if it weren't for this thread on MiceChat, a search on Google for "Share your Duffy photos" wouldn't turn up those links to Pinterest! Oh! Here are some I took for Easter and never got around to putting up, but whatever; food is food. "I am helping Eeee-va's mom make homemade crescent rolls!" "I thought the rolls had enough butter to keep them from sticking, but I am not an expert at baking yet, so I will use non-stick spray like Eeee-va's mom suggested." I know I used to post in this thread a lot but I just haven't been able to take Duffy on any major adventures lately. But I might finally be getting a new AP to WDW before summer is over, so... that's a start. Things have just been crazy in my little world over the last year and now things are slowly starting to fall back into place... I think. Plus I got a big box of Duffy & other goodies from Tokyo & Hong Kong coming in July from a friend of mine who has been picking stuff up for me on their recent visits (sadly they haven't been able to send my stuff out yet due to work keeping them super busy and a few other mishaps along the way). I'm super excited to see what I'm getting (all I know is they picked me up some size of Gelatoni and a badge of Dear Danny the lamb - the rest is all a surprise).